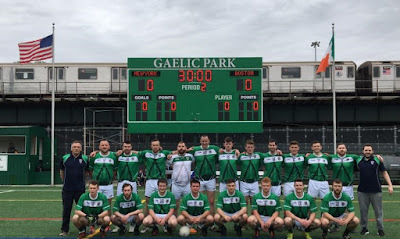 The second round of the Pat O’Brien Cup was played at the Irish Cultural Center, Canton Mass Saturday afternoon with strong wins for Donegal and Wolfe Tones in Group A, and for Aidan McAnespies in Group B. The situation means that it boils down to Donegal and the Tones looking for the win to secure the top spot in Group A, and in Group B it comes down to the Macs and Blues next week to see who makes the final. Galway got the better of this exchange on Saturday afternoon. For Galway it was their first outing of the season and the westerners never really had a chance to settle into the game. Donegal held a 7 point lead at the half, a goal from Sean Donnelly early on set the tone. Donnelly and Lee Carr proved hard for the Galway defence to contain, and in the middle of the field Darren Grant was a towering presence. Galway’s scores came from Frank McCormack, Ryan Garry and Kieran Gallagher. Donegal maintained their hold on the game throughout the second half, and have three points from their 2games, sitting on top of the table. Connollaidh Deeney Slips through a Gaels challenge. In the other group A game the Wolfe Tones put in a very strong looking performance and left the Gaels shaking their heads at the final whistle. Corner forwards, Dean Curran and Thomas Beckett ledd the Gaels corner backs a merry dance, while Ronan Jones in the middle of the field and Connolaoidh Deeney at center back, the Tones gave little away. Two early goals rocked the Gaels, Curran and Cormac Joyce-Power netted. 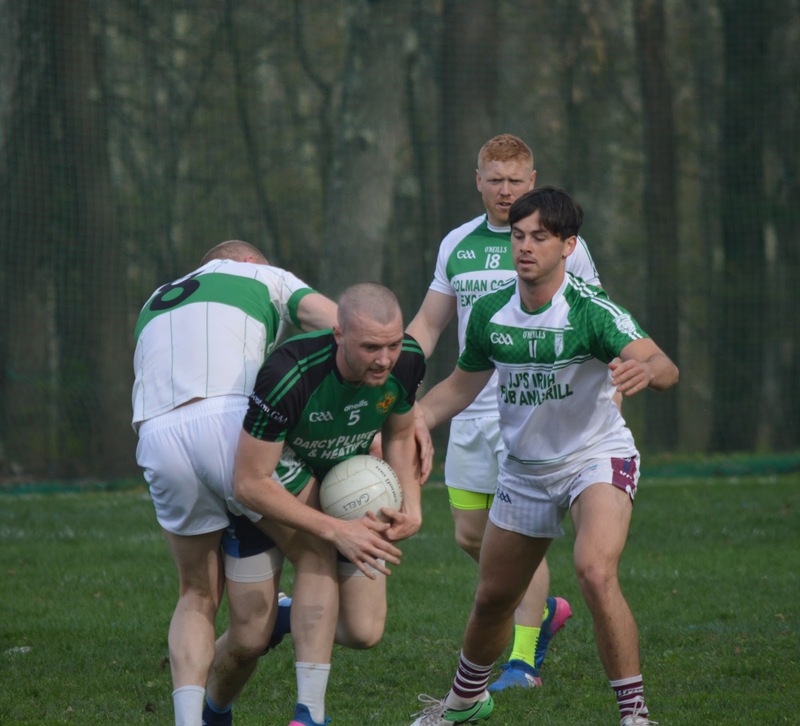 The Gaels found a glimpse of rhythm with three points on the trot and it looked as though there could be a game on the cards. Another Tones goal from Curran restored the Tones lead, and at the break it was a 3-4 to 0-5 score in the Tones favour. The second half saw the Tones run away with it. Eoin Connolly made some point blank saves from the rampant Tones forwards, but with points from Beckett and Joyce-Powerthe distance between the teams grew. Curran netted another goal mid-way through the half shortly after Connolly had denied the Derry man. Joe O’Shea put a consolation goal away for the Gaels, and at the back David Black toiled hard in the face of a constant pressure. 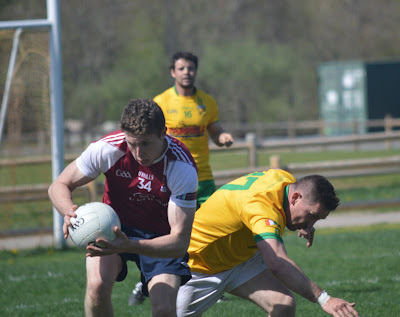 Shane O’Brien even chipped in with a point after entering the fray, as did brother Mike, and Jones capped of the goals to round off a good outing for the South Boston men. Seamus Loftus on the ball for Cork. Aidan McAnespies more or less steamrolled over Cork. It was the first outing of the season for the Macs, and in many ways saw a second generation of players don the jersey. Caolan Harvey featured from the start in the half back line, and Owen Gormley entered the fray in the second half. The first half saw a deluge of goals as Robbie Croft, Paul Clifford, and Oisin McNulty combined well. Croft was in good form on the first outing of the season, as was JP Gallagher and Philly McCusker. The scores kept on coming for McAnespies, and late in the game the young Gormley netted twice, and Colm O’Malley also got his name on the scoresheet. It boils down to the Macs and the Blues next week for a place in the final. 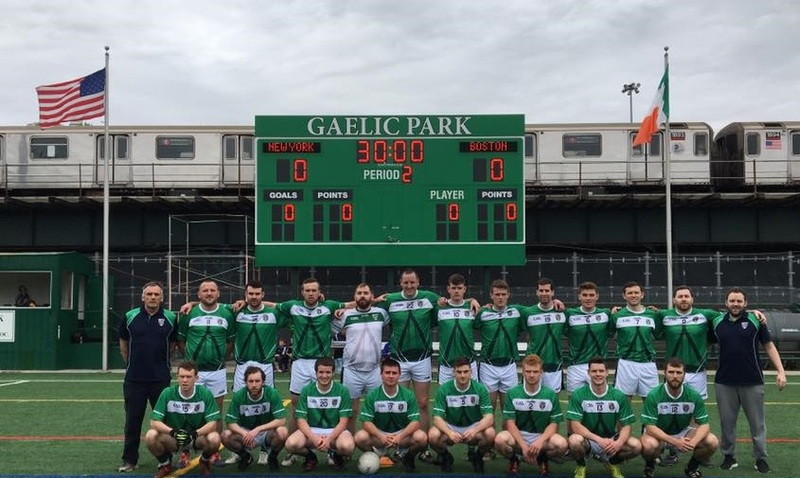 A football and a hurling team from the Boston Northeast division traveled to New York to play a part in the Connacht Championship weekend. The teams played New York Development Squad teams. New York won both games, but the Boston players put up a good fight. It was a great development to see teams made up entirely of American Born players representing the division. Hurling: Mike Kennelly, Michael Walsh, David O’Connor, Matthew Parks (Providence), Adam Mackie, Chris Laggis, Eric Stassen, Andrew Collins (Hartford), Dan Flanagan, Patrick Adukoni (Portland) Will Mullen, Alec Foley (Concord), Matt Dufresne, Bill Sheehan, Tim Jackson, Jeremy Goldkuhl (Worcester), Jack Martin, Liam Moore (Fr. Tom Burke’s), Kevin Joyce (Wexford). Football: Stephen Murray, Kevin Walsh, A.J. Maguire (Connemara Gaels), Declan Harrington, Jack Lynch, Denis Harrington, Emmet Smith (Cork), Shane McKenna, Oisin McNulty (Aidan McAnespies), Paudie Kenneally, Dan Kenneally, Jerry Kenneally (Christopher’s), Mark Dunphy, Ciaran McDevitt (Donegal), Maurice Young, Pat Murray, Conor Fitzgerald, Pat Moriarty (Shannon Blues), Ger Davoran, Michael Moylan (ISYL).